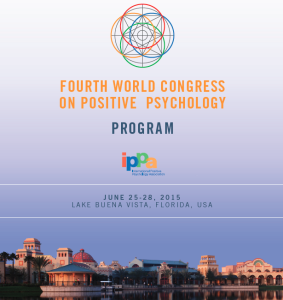 Click the image below to download an electronic version of the Fourth World Congress program. * Separate registration is required. This event, along with a catered reception to follow, is included in the cost of a full Congress Registration. Individual tickets may be purchased through the online registration process by choosing the “Thursday Welcome Reception and Keynote Lecture Only -Catered” option, or by downloading, printing and returning this registration form. Martin E.P. Seligman is the Zellerbach Family professor of psychology and director of the Positive Psychology Center at the University of Pennsylvania, where he focuses on positive psychology, learned helplessness, depression, ethno-political conflict, and optimism. He is a best-selling author of several books including, most recently, Flourish. He received the American Psychological Society’s William James Fellow Award for basic science and Cattell Award for the application of science, and two Distinguished Scientific Contribution awards from the American Psychological Association. In 1996, Seligman was elected president of the American Psychological Association by the largest vote in modern history. His current mission is the attempt to transform social science to work on the best things in life—virtue, positive emotion, good relationships, and positive institutions—and not just on healing pathology. Bio: Tal Ben-Shahar is an author and lecturer. He taught two of the largest classes in Harvard University’s history, Positive Psychology and The Psychology of Leadership. Today, Tal consults and lectures around the world to executives in multi-national corporations, the general public, and at-risk populations. The topics he lectures on include leadership, happiness, education, innovation, ethics, self-esteem, resilience, goal setting, and mindfulness. His books have been translated into more than twenty-five languages, and have appeared on the best-sellers list around the world. Tal is a serial entrepreneur, and is the co-founder and chief learning officer ofThe Wholebeing Institute, Potentialife, Maytiv, and Happier.TV. An avid sportsman, Tal won the U.S. Intercollegiate and Israeli National squash championships. Today, for exercise, he swims, dances, and practices Yoga. He obtained his PhD in Organizational Behavior and BA in Philosophy and Psychology from Harvard.